Creating a B2B marketing plan can be a daunting task. After all, the success of your business stems in part from your ability to attract and communicate with both potential and existing customers. If you’re a little lost about how to create a B2B marketing plan, have no fear! 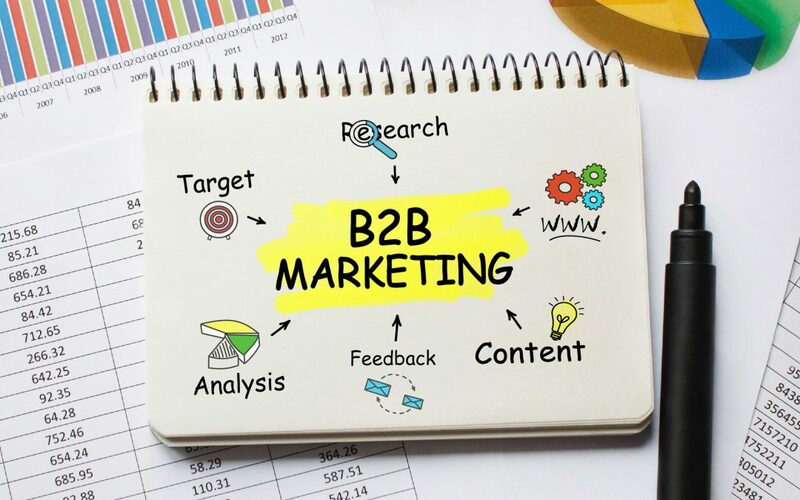 This article will outline the basics of how to develop a strong B2B marketing plan to help you grow and maintain your business. Marketing and sales plans are no different. In order to effectively market and sell to a customer base, you need to spend the time to define your target customer and audience. The best way to start? Think about the actual buyer of your product or services. What are their problems and needs? What is their biggest business challenge they’re trying to solve? How will your product bridge that gap? While it’s tempting to say, “anyone in business can benefit from our product,” taking the time to narrow it down will help you in both the short and long-term and create a stronger B2B marketing plan. Once you’ve identified your target audience, what’s important to them, and how your product can help them to solve those challenges, it’s time to define your strategy. Where are these buyers? What tools do they use to research solutions to their problems? What’s the best way to talk to them about your products? If your product leans more experiential, it may be easier to get in front of them at a tradeshow. If it’s software, you’re looking at a heavy digital emphasis. Setting the strategy will also depend on the health and goals of the business as a whole. If you’re the dominant player in a saturated market, your marketing plan will focus on customer satisfaction and retention. If you’re a start-up in a new vertical, you’re looking for the opportunity to get in front of as many prospects as possible. A SMART goal is defined as follows: one that is specific, measurable, achievable, results-focused, and timely. Let’s say your one of the company’s objectives is to grow market share in a specific vertical.Translating that into a SMART goal would look something like this: Increase the number of leads in the manufacturing sector by 15% by Q2. The goal is specific to industry and action, it’s measurable, we assume it’s achievable, it has a specific outcome in mind, and has a deadline. Be careful to create goals that you can impact. For example, a marketing organization has far more control over leads than it does over conversion (in non-digital channels). Also, try to keep them specific. Many an executive has written down a goal of “becoming the #1 provider in the industry.” It’s a wonderful aspirational goal but has little use in your B2B marketing plan. Once you’ve set your goals, you need to get down to the nitty-gritty of planning how you’ll achieve them. List out your campaign options, print, digital, email, etc, and determine how you’re going to tackle each of them. As mentioned earlier, when choosing your marketing channels, you need to be very cognizant of where your target buyer is. It’s also important to prioritize your actions. Where do you think you’ll get your highest conversions? Where are your competitors and do you need to enter that space as well? For example, if they’ve bought every billboard or wrapped every bus in town, do you need to do so too? Try and keep your plan fluid. If you’re new to the market and aren’t sure what will work, try something for a month or a quarter, and then move your focus around if the tactics you’ve employed aren’t working. Having created an action plan, it’s common to ensure alignment of this plan across all channels. While you may use each channel slightly differently, it’s important that key messaging, branding and overall tone should remain consistent. Repurposing messaging across channels can be cost-effective and help to scale your B2B marketing plan, just make sure that you’re taking into account the different formats and approaches and customizing accordingly. KPIs, or Key Performance Indicators, will provide your barometer as to how well you’re achieving your SMART goals. These metrics also need to help decision-makers in the business assess progress fairly quickly. Your KPIs will clearly depend on the goals you’ve set. Common marketing KPIs look at leads generated, conversion rates, cost per lead, customer retention, and net promoter score, just to name a few. There are also some common KPIs broken down by marketing function. For example, your content team may look more closely at blog visits or the number of social media shares and your digital team might look at the time on page/site, return visits or bounce rates. Develop KPIs that will measure what’s important and align with your goals and action plans. Scalability comes along with efficient use of your CRM and marketing automation software. The tasks that used to take three marketing coordinators can now be done with one coordinator, part-time. Whether it’s building a landing page, qualifying leads, or creating forms for email campaigns, marketing automation tools can cut the time needed for the marketing team to engage in these activities. Having marketing automation tools can also make it much easier to manage campaigns across channels, gather data on those results, and create a KPI dashboard to manage your strategy and tactics in real time. Last, but certainly not least, is to make sure your B2B marketing plan has alignment with the overall business and buy-in from key internal customers, including sales, finance, and operations. There is no quicker way to sink a marketing plan than to have a lack of buy-in. Spending the time to communicate and update business partners will ensure a stronger plan and a dedicated company-wide effort towards support and success of your plan. B2B marketing plans can be overwhelming at first but if you follow our simple guide, you’ll create the best B2B marketing plan for your business. If you’re looking for marketing support, whether it be SEO, analytics integration, or website support, give us a call. We can help you to build your business and achieve your marketing goals.